As the nation rallies to help the people of Houston and the Gulf Coast recover, we should also prepare in our own homes and communities to make sure that we are ready for the next big storm. California is showing the way forward with solutions that give rivers more room. The enormous human tragedy unfolding in Texas, as a result of Hurricane Harvey, is a reminder that communities all over the United State are vulnerable to catastrophe when extreme weather events hit. As the nation rallies to help the people of Houston and the Gulf Coast recover, we should also prepare in our own homes and communities to make sure that we are ready for the next big storm. Hurricanes and extreme floods are natural phenomena, but they can become human tragedies and economic disasters when we fail to prepare. Fortunately, we have new experience demonstrating how innovative flood management can gives us more tools to meet this challenge. In California, American Rivers has been working with the state of California to develop a new flood plan for the Central Valley. 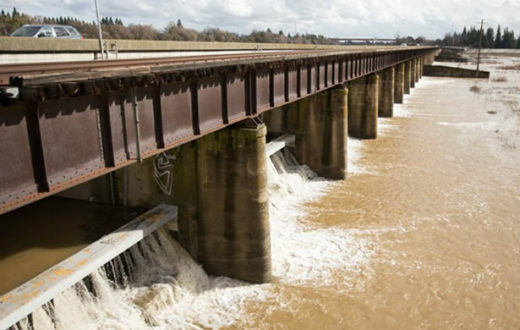 In August, the Central Valley Flood Protection Board adopted that new plan, which will help protect more than a million people from devastating floods. Additionally, beyond providing for critical public safety, it will help restore the region’s rivers, fish and wildlife and groundwater supplies. By creating new parks and trails, it will also enrich the lives of Californians. More on that plan, below. 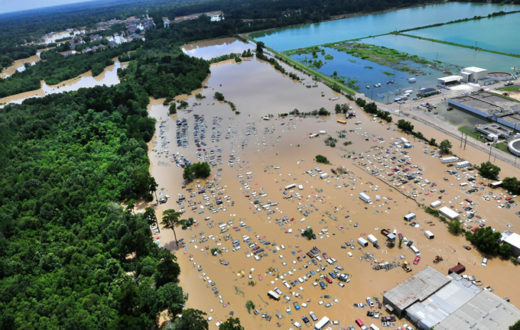 The first step in preparing for extreme floods is confronting the risk. That risk is easy to overlook. After all, the odds of an extreme storm might be less than one percent in a single year. Your community could go many decades without seeing one. But, eventually, as in the case of the Gulf Coast today, an extreme storm will arrive. In addition, climate change is increasing the flood risk communities face. Confronting floods is one of the keys to making sure that our communities and natural resources will be resilient as our climate warms. California and the Gulf Coast are both uniquely vulnerable to extreme precipitation events. Although the 50 inches Harvey dumped this week is setting a national record for totals over a single week, California has even more frequent high precipitation totals over three day periods. 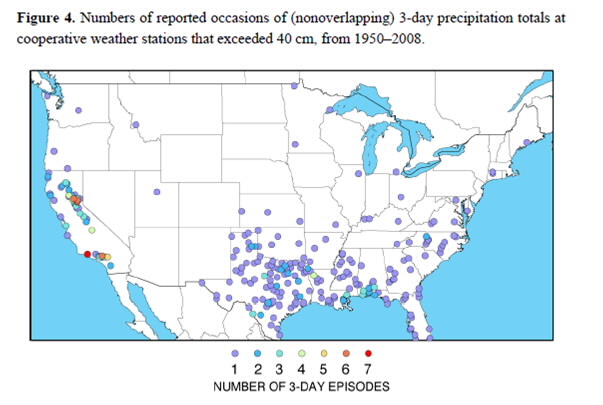 The following map from a scientific article about atmospheric rivers in the journal “Water” shows how California and the Gulf Coast both stand out when it comes to extreme precipitation. Atmospheric rivers are jets containing staggering quantities of moisture from the tropics that periodically drench California and account for most of our floods and water supply. The great flood of 1862, which destroyed 1/3 of the taxable property in California, was almost certainly caused by an atmospheric river. A few years ago, the USGS attempted to simulate what might happen if we were struck with a similar ARk storm (Atmospheric River 1,000 year event) today and concluded that the resulting flood would displace 1.5 million people and cause flood damages totaling a whopping $725 billion. If you are thinking that a 1,000 year event is too improbable to worry about, think again. There is evidence of six storms in the geologic record over the last 1,800 years that are larger then the flood of 1862. We are overdue. In addition, climate change could increases the risk we face, if more of the precipitation falls as rain rather than snow at the higher elevations of the Sierra Nevada. For a quick read about the flood of 1862, ARk storms and the new Central Valley Flood Management Plan, check out the recent story and editorial in the Sacramento Bee. The scale of the risk is daunting. 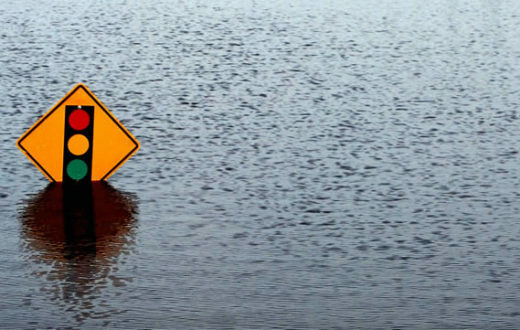 Fortunately, the new flood plan provides a road map to prepare for future floods in California’s Central Valley, which earlier settlers described as an Inland Sea. Giving rivers more room is the best way to keep communities safe from floods, and giving rivers more room provides multiple-benefits like clean water, parks and open space, groundwater recharge, and fish and wildlife habitat. 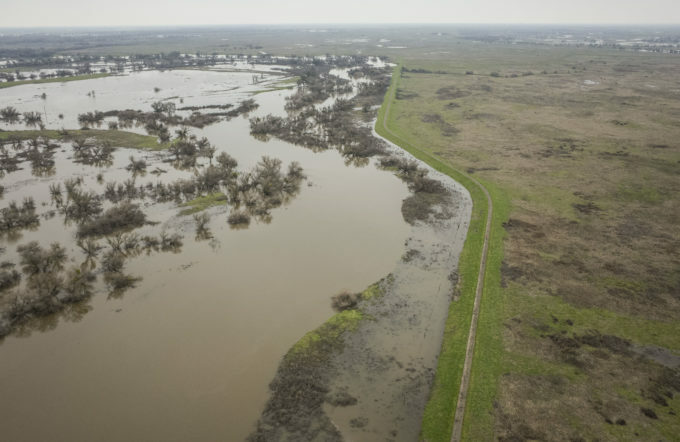 California’s new plan calls for expanding floodways and creating a new flood bypass at Paradise Cut on the Lower San Joaquin River to protect the rapidly urbanizing areas of Stockton, Lathrop, and Manteca. This new bypass will lower peak flood stage along 30 miles of river with a peak stage reduction of 2.5 feet at the I-5 Bridge, where thousands of new homes have recently been built. American Rivers led the design process and is leading the way to acquire the flood easements from private landowners that will be necessary to build the bypass. We have already obtained $4 million from the California Delta Conservancy and the California Department of Fish and Wildlife to buy flood and conservation easements for the new bypass. We are also helping the California Department of Water Resources expand the Yolo Bypass to better protect Sacramento. That expansion will aid the recovery of salmon runs on the most important salmon migratory corridor on the West Coast south of the Columbia River. The new flood plan calls for prioritizing multi-benefit flood management projects that are designed to reduce flood risk and enhance fish and wildlife habitat. Those projects can also create additional public benefits such as sustaining agricultural production, improving water quality and water supply reliability, increasing groundwater recharge, and providing public recreation and educational opportunities. For struggling fish and wildlife, the news that smart flood projects can help fight the impacts of climate change is welcome. Salmon are a cold water fish. A warming climate stresses salmon and many other species. But multi-benefit flood projects help salmon and other natural resources in many ways. These projects create riparian and wetland habitat, and increased floodplain habitat that is well known for producing larger, healthier juvenile salmon. By allowing more water to pass safely, these projects can allow upstream dam operators to hold more water in reservoirs. More stored water means more cold water at the bottom of the reservoir. This cold water can literally be the different between life and death for salmon eggs and juveniles during the warm months of late summer and early fall. Some of the many benefits of these new flood projects aren’t obvious at first glance. But among those benefits is a chance to make our rivers, fish, and wildlife more resilient in a warmer future. Breaching the levee at the San Joaquin River National Wildlife Refuge to reconnect 3,000 acres of floodplain. 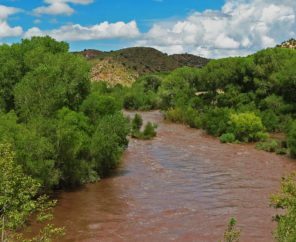 Restoring 2,000 acres of riparian and floodplain habitat at the Dos Rios Ranch across the river from SJRNWR. Removing a levee to restore 220 acres of floodplain habitat for salmon at Great Valley Grasslands State Park. Reconnecting the Oroville Wildlife Area to the Feather River to create rearing habitat for juvenile salmon. Setting back 7 miles of levee on the upper Sacramento River to reconnect 1,400 acres of floodplain and improve flood protection for Hamilton City. Expanding the floodway on the upper San Joaquin River to provide 100-year protection for the City of Firebaugh along with wildlife habitat and recreational opportunities for an economically disadvantaged community. The Southport Project in the City of West Sacramento is one of the most exciting and ambitious multi-benefit flood management projects moving forward in the Central Valley. West Sacramento has a population of 52,000 people and is situated on the west side of an urbanized reach of the Sacramento River that is severely constrained by levees. The project is necessary to provide 100-year protection for the established and growing urban center. 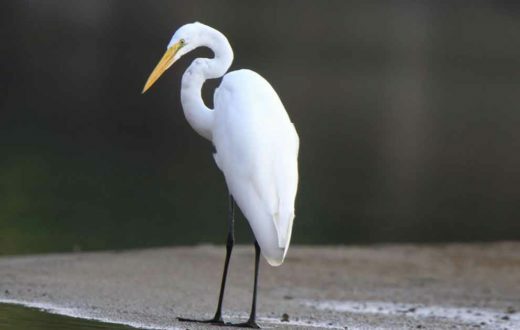 The project will set-back 5.6 miles of levee creating a new floodplain area 400 to 1,000 feet wide, creating 200 acres of forested wetlands in the heart of the Sacramento metropolitan area. A riverside trail will allow people to enjoy the riverside forest and access the river along the six mile long project, which will ultimately provide high quality habitat for several native species including juvenile rearing habitat for endangered Chinook salmon. California is leading the way in responding to extreme floods and climate change related flood risks, both by adopting a plan founded in modern flood management, and by building multi-benefit projects on the ground. The broad benefits of this new approach explains why the new flood plan and multi-benefit projects enjoy extraordinarily broad support among California’s agricultural, flood agency, environmental, fishing and scientific stakeholders. Thanks to the California Department of Water Resources, the Central Valley Flood Protection Board, American Rivers and many other government agencies and conservation organizations, California is preparing for floods in a way that will not only respond to a warming climate and reduce damage when the ARk storm arrives, but will also improve the quality of life for fish, wildlife, and people. 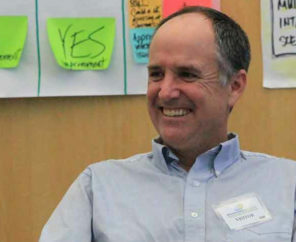 I have been trying to engage John Cain and American Rivers for over a year and would like to have some help advocating for multi-benefit, non structural treatment of 4-6 miles of the Santa Clara River in Ventura County. The county is going forward with plans to pave the river south bank with no water conservation, recreation or biological features. NONE. See the intro webpage linked below and then please contact me for more info. These are exciting new projects both for people & animals (I.e. water). Cali certainly needs these implemented & soon, especially before we get hit with a mega ARK storm. I’m recalling the recent atmospheric wave that struck us in February. It was truly frightening but could have been much worse. The new projects offer so much good for California!! As a Cali resident & nature lover as well, I much appreciate all these projects. We need to make smart decisions about our natural resources. Ignoring scientific details, making decisions that are ego driven with no consideration about what future generations will inherit is reckless. Clean Air & Water Are ESSENTIAL 4 LIFE! WE NEED POLITICIANS WHO BELIEVE IN CLIMATE CHANGE. NOW. Not Later! Can giving rivers room help keep communities safe?